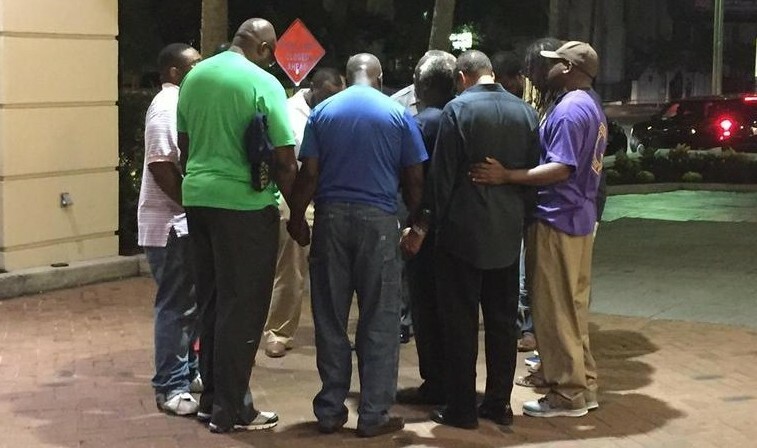 Local pastors gathered outside the Courtyard Marriott down the street from the church. Photo credit Liz Kreutz via Twitter. The world awoke this morning to tragic news of the deadly shootings at a church in Charleston, South Carolina, USA. As authorities investigate, it is clear that members at Emanuel African Methodist Episcopal Church were meeting for Bible Study and prayer when a Caucasian man in his mid-20s opened fire. The man had been attending the meeting with his victims, and managed to escape by car. He has not yet been captured. Among those who perished was pastor and state senator, Clementa Pinckney, who had two young children. Information on the other victims has not yet been released, but nine have been confirmed dead. Along with all other good-thinking people, we are horrified and deeply saddened to hear of the dreadful act of violence at Emanuel African Methodist Episcopal Church in Charleston, South Carolina, in which nine persons have died. Our hearts and prayers go to those who have been so tragically bereaved and to the injured and their families. May God’s strength and grace be on those who are seeking to bring help and healing in this situation. Happening on the eve of the presentation of the World Methodist Peace Award for 2014, we are reminded that the work towards peace must always be a priority. Emanuel African Methodist Episcopal Church is the oldest AME church in the South and has one of the oldest and largest black congregations south of Baltimore. It is affectionately referred to as “Mother Emanuel,” and one of its founders was renowned abolitionist, Denmark Vesey. A quote by Sister Jean German Ortiz on the home page of the church’s website the day following the shootings so appropriately states “Jesus died a passionate death for us, so our love for Him should be as passionate.” In the midst of this tragedy, may the Emanuel AME Church family and the Charleston community feel peace and comfort from the God who conquered death itself.